This week, President Barack Obama put the full force of his presidency behind a growing national movement for prison reform and issued an executive order to ban the box. For years it has been well known that when employers consider the notorious box checked on job applications by ex-felons seeking employment, the applications are usually tossed aside—automatically weeded out of the pool of potential candidates for hire. Justice Department research has shown up to 75 percent of former inmates cannot find employment their first year out of jail. The same research also proved a criminal record reduces employer interest in potential candidates for employment by an average of 50 percent. These facts added dramatic impetus to the need for change. The President announced his ban the box initiative on Monday as another initiative aimed at criminal justice reform. The initiative, which takes effect immediately, mandates the federal Human Resources Department delay inquiries into criminal history of all candidates seeking federal employment opportunities until later in the hiring process. The President’s words and action gave a sure boost to growing national momentum calling for a meaningful overhaul of America’s criminal justice system. Currently, there is a bi-partisan congressional effort focused on criminal justice reform being championed by Kentucky Republican Senator Rand Paul. Criminal justice reform, including efforts to ban the box, also has strong public support from Democratic presidential candidates Hillary Clinton, Martin O’Malley and Bernie Saunders. It would be remiss, however, not to credit progress in this area to those in the trenches who have waged a sure battle for criminal justice reform for years. Their efforts aimed at second chances for those who have paid their debt to society have impacted this movement in significant ways. Before the president made his announcement this week, over 100 cities and counties had already implemented ban the box initiatives. In addition, 19 states, including California, already had ban the box policies in place. When California implemented its ban the box initiative in July 2013, it was estimated the legislation could potentially assist nearly seven million California residents with criminal records. The law, AB213, barred public sector employers from asking for information about a job applicant’s criminal background until after the applicant has passed the preliminary stages of the application process. In 2012, as California considered its ban the box initiative, the federal Equal Employment Opportunity Commission (EEOC) was also weighing in on the issue. The EEOC recommended banning the box as a best practice in hiring policy—a recommendation perceived by many as both warranted and necessary because America’s incarceration rate was continuing to explode to unprecedented levels. America’s evolution to increased incarceration rates was not unlike the way the country has historically facilitated a mission creep in war. The increase began slowly with President Nixon’s declaration of a war on drugs in June 1971. By un-divine contrivance the country’s incarceration rates continued to rise subtly just as the civil rights movement waned in the wake of Affirmative Action driven gains in employment opportunities experienced by African Americans as the 1970s continued to unfold. The trend toward increased in incarceration rates were accelerated in the early 1980s, when then first lady Nancy Regan uttered the now infamous phrase, “Just say no,” to drugs—America’s strange drug war against itself accelerated and the incarceration rates continued to climb. African Americans were disproportionately impacted by the war on drugs. They were charged with more serious crimes; usually lacked financial resources for paid legal defense; and as a result, were more often convicted and usually endured lengthier sentences. Many who have served their time in prison still struggle for redemption in the eyes of their community. Their quest is made more difficult because they usually cannot find gainful employment owed to their criminal background. They experience a form of double jeopardy—having served their time they continue to be penalized by a society that makes it difficult, if not impossible, for them to make a living. In November 2013, the Nation Magazine published an in-depth report in partnership with the Investigative Fund of the National Institute entitled, Boxed In: How a criminal record keeps you unemployed for life. The report highlighted a number of prescient facts about the history of employment background checks and how such checks have served to lock ex-felons out of the job market. In 1987, according to the report, the Equal Employment Opportunity Commission (EEOC) declared that blanket bans on hiring people with criminal records were a Civil Rights Act violation. According to the EEOC, federal law not only bans bias based on protected categories like race, but also any policy that on its face appears neutral but can have the effect of reinforcing racial disparities. The EEOC reminded employers they can consider criminal records only as a factor in hiring, and then, only when the conviction is directly related to the work. Since that time, according to the report, Congress may be the most responsible for employers’ limited adherence to the EEOC’s guidance. Following the events of September 11, 2001, lawmakers issued bans that precluded former felons from working in a broad range of transportation jobs. The states followed suit. As a result, the list of banned occupations grew exponentially to include positions like private security guards, nursing home aides, almost every job involving children, etc. According to one study, former felons are now barred from working in more than 800 occupations because of laws and licensing rules. Ex-felons have paid their debts to society and earned a second chance. However, it is not surprising in a society where discrimination still festers barely hidden under thins layers of unequally administered justice, that African Americans happen to be the most impacted by discrimination against ex-felons in employment. Research has shown when white and black applicants both have criminal records employers are far more likely to call back a white applicant than a black one. A 2009 re-entry study conducted in New York City found white applicants suffered a criminal record penalty of 30 percent; however, that criminal record penalty doubled to 60 percent for black job applicants. 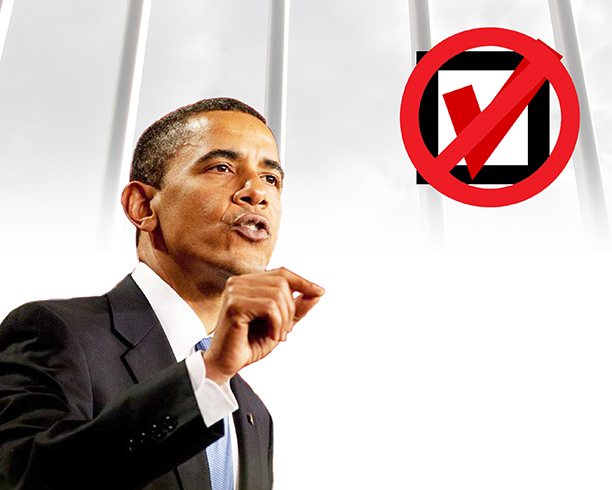 President Obama’s new plan addressed more than the issue of ban the box. It called for the Department of Education to award eight million dollars in federal grants over the next three years to help provide educational opportunities for ex-inmates. The president also called for the Department of Housing and Urban Development to establish more purposeful guidelines aimed at the most appropriate way to consider arrest records when making decisions about who can live in federally subsidized housing. Local agencies like Starting Over Inc. were pleased with the president’s action. Starting Over helps some of the area’s most vulnerable populations by addressing homelessness, recidivism, and reentry. The organization specializes in the provision of transitional housing, community services, community health services, post conviction relief, community living services and more. Obama’s action may provide the needed cover for some elected officials to take up the banner of criminal justice reform. “Having the Commander- in- Chief stand up and speak out on this issue will give confidence to make these policy changes without worrying about the next election,” Quarles added. Quarles also cited a study recently conducted in San Francisco in relation to their success with ban the box. According to the report, 11 percent of the applicants were felons. Of the 11 percent that applied nine percent were ultimately hired—great proof banning the box does work. Unfortunately, according to Quarles, it has been challenging to determine ban the box progress in the Inland Empire as municipalities have claimed they do not have such data available. Quarles did however, point to a recent study by the University of Redlands that told a very compelling story about the Inland Empire’s progress on this issue. The report published late last month looked at the local implementation of the state’s Ban the Box initiative, Proposition 218. Proposition 218 was not only designed to enhance access to public jobs at the state level; but, at county and city levels as well. University of Redlands research found the inland area is not implementing the rule change. The report revealed some cities in both Riverside and San Bernardino Counties did not even know the law existed.